The R&A and USGA publish revisions to their joint publication ‘Decisions on the Rules of Golf’ every two years. But last week, they took the unusual, but welcome, action of announcing that Decision 33-7/4.5 has been revised with immediate effect. This is their response to recent criticism from some quarters that players are being disqualified for score card errors that have only been identified due to advances in video technologies, such as ultra slow motion and high definition. Decision 33-7/4.5 addresses the situation where a player is not aware he has breached a Rule because of facts that he did not know and could not reasonably have discovered prior to returning his score card. For an example of this see my blog entry concerning the recent Padraig Harrington incident. Under this revised decision and at the discretion of the Committee, the player still receives the penalty associated with the breach of the underlying Rule, but is not disqualified. 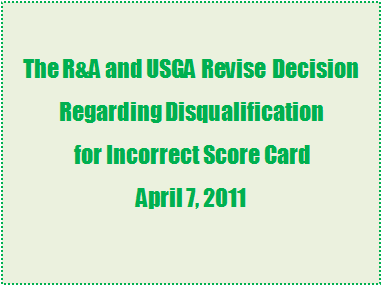 However, the Ruling Bodies have made it clear that this revised Decision does not affect score card breaches that arise from ignorance of the Rules of Golf, which do still result in disqualification. For an example of this see my blog entry concerning the recent Camilo Villegas incident. This clarification reinforces the fact that it is a player’s responsibility to know the Rules, while recognising that there may be some rare situations where it is reasonable that a player is unaware of the factual circumstances of a breach. The wording of the revised Decision 33-7/4.5 is worth reading, but is quite lengthy. It can be viewed at both the R&A web site and the USGA web site. If you want to know how Kevin Na scored a 16 on one hole during round 1 of the Valero Texas Open, here is a five-minute video of how it happened, courtesy of PGA Tour.com. Video of Kevin Na (5 mins 50 secs): YouTube link. I hope that this doesn't happen to you this weekend, or ever! this doesn't seem so cut and dried, a player whose ball is in the hazard can stick something in the hazard.. I accept that this subject is not black or white. 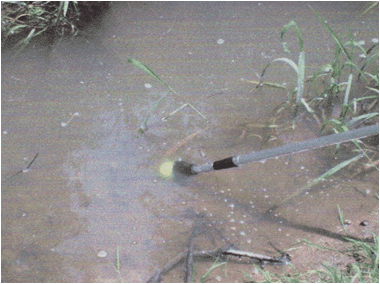 However, I am still of the opinion that if your ball is within the margin of a water hazard, but not in the water, then you may not intentionally stick an object into the water, as per Decision 13-4/0.5.